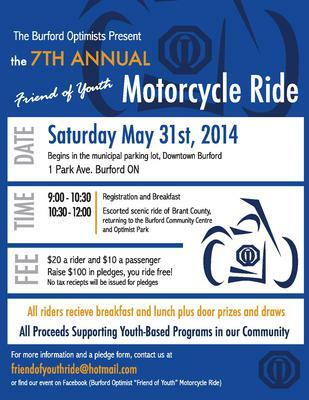 Meet in "Downtown Burford" between 9 and 10:30 on May 31st 2014 for registration and then head out on a 90 minute tour of the area. We return to town at the Burford Optimist Park (where the Optimist kids bicycle rodeo is wrapping up) for BBQ lunch and prizes. $20 per rider or free if you raise $100 or more in pledges. Email me for more info and pledge forms.